The competition for most misunderstood economic statistic is hard-fought, but there is a clear winner: the trade deficit. No other number is interpreted so differently by professional economists and the general public. Common reactions to the U.S. trade deficit range from belligerence to dejectedness: It is thought that America’s trade deficit exists either because of the skullduggery and unfair trade practices of countries that shut out U.S. products, or because American companies are failing to compete against their global competitors. In either case, the preferred solution is often to get tough in trade negotiations for the sake of protecting U.S. jobs. But, according to most economists, cutting across partisan and ideological lines, such mainstream beliefs about cause, effect, and solution are wrong. Even more bothersome, these popular beliefs are wrong not simply because the evidence is against them—although it is—but because they reflect fundamental misunderstandings of what the trade deficit is and how it interacts with the rest of the economy. For economists, that article didn't didn't offer any new lessons. It was just one more effort by to explain the intuition behind the economics of trade deficits--as taught in standard intro econ classes--to the general reader. The history of such explanations runs deep; indeed, back to Adam Smith and earlier. Apparently, the subject is difficult to exposit and economists aren't very good at doing so. 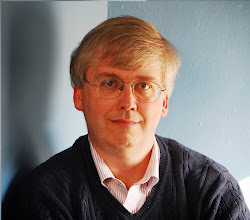 Robert Z. Lawrence takes one more swing at the pinata in "Five ReasonsWhy the Focus onTrade Deficits Is Misleading," published by the Peterson Institute of International Economics. (March 2018). I'll start with some background, and then link it to Lawrence's list of misconceptions. It seems to be widely believed that a trade deficit shows the level of unfairness of import competition, and moreover that a trade deficit shows economic weakness, while a trade surplus shows economic strength. (For a vivid example, see the "Remarks by President Trump at Signing of a Presidential Memorandum Targeting China’s Economic Aggression" last week.) But even a casual look at actual US trade balances in recent decades shows the implausibility of such beliefs. 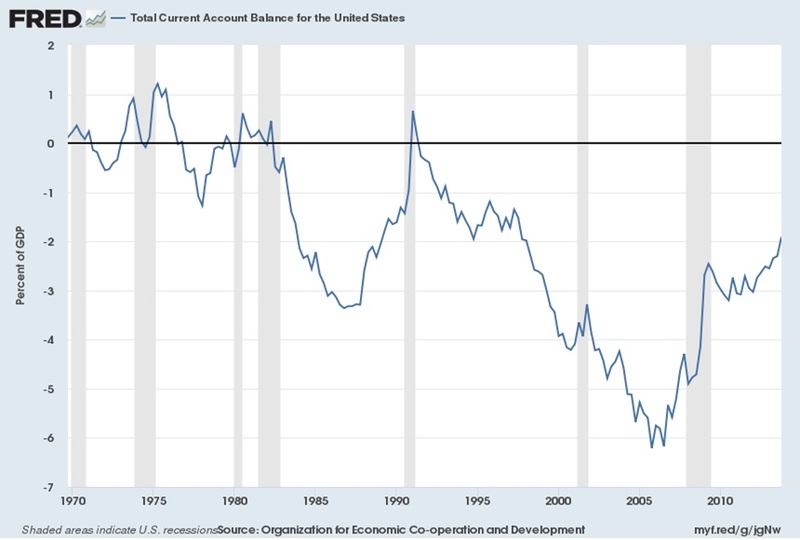 Here's a figure of US trade imbalances (as measured by the current account balance) since 1970, measured as a share of GDP. In the 1970s, trade deficits were close to zero. But this did not mean when most people believed that international competition was fair: instead, it's a time when foreign competitors from Japan and elsewhere were savaging US industries like cars and steel. It's also not a time when the US looks especially strong, with a period of "stagflation" combining high unemployment and inflation, as well as a slowdown in productivity growth. In the 1980s, trade deficits first boomed, and then diminished. But the mid-1980s was not a time of US economic weakness: instead, these were years of hearty economic growth after the recession of the early 1980s. The recession of 1990-91 is actually when the trade deficit declined. Moreover, no one seriously claims that US trading partners suddenly became much less fair for a few years in the mid-1980s, before then suddenly becoming much more fair by the early 1990s--which means that unfairness of trade isn't what causes the US trade deficit to change. Through the 1990s, this is a period when the US trade deficit becomes large, but at the same time, the US economy grows rapidly. Also, this is not a time a higher trade deficit can be linked to barriers to trade increased: instead, this is the decade when barriers to trade are reduced by the North American Free and by the completion of the "Uruguay round" of international trade talks leading to the creation of the World Trade Organization in 1995. 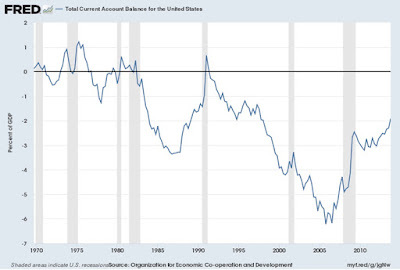 Since 2000, the trade deficit first falls when the economy is growing in the early 2000s, and then the steep recession of 2007-2009 is accompanied by a sharp decline in the trade deficit. If the trade deficit is a measure of unfair trade (which it isn't! ), the US should presumably be congratulating the rest of the world for how it dramatically improved its trade fairness since about 2006. It is blindingly apparent from the most casual acquaintance with the actual trade balance statistics that trade deficits are often not associated with periods of weak economic performance, that declines in trade deficits are not associated with strong economic performance, and that fluctuations in foreign trade barriers are a deeply implausible explanation for changes in the trade balance. One can walk through the same exercise with trade balances of other countries, as well. 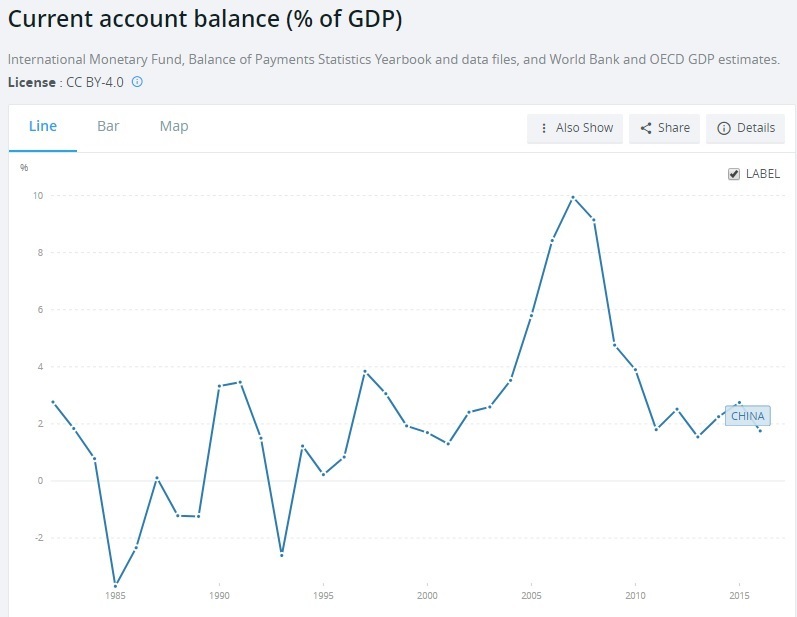 For example, here is China's trade balance since its reforms started in the late 1970s, from the World Bank website. China's trade surplus as a share of GDP was low, mostly near-zero and sometimes in deficit, from the early 1980s up to around 2000. Of course, China's economy was booming during these decades, which suggests that its small trade surpluses during this time were not a primary driver of its growth. Also, if a trade balance measures openness to trade (and it doesn't), then one would need to conclude that China was more open to US imports in the 1980s and 1990s than later, after it joined the World Trade Organization and reduced trade barriers in 2001. Further, one would need to believe that China had a dramatic spike in trade unfairness around 2007, followed by a dramatic return to trade fairness just after that. Of course, none of these interpretations about China's trade balance and its level of openness to foreign trade can pass the laugh test. If trade balances are not about economic strength or about trade barriers of other countries, what are they about? Let's go back to basics. A trade deficit means that a nation is importing more than it is exporting. To put it another way, other countries are earning US dollars by selling into the US market, and a share of these US dollars are not getting spent on US-produced goods and services. (After all, if all the US dollars earned by those abroad selling into US markets were spent on US-exported goods and services, no trade imbalance would exist.) Instead, the value of the US trade deficit represents a flow of financial capital that is invested into the US as investment capital. Thus, a trade deficit necessarily and always means an inflow of international capital, while a trade surplus necessarily and always means an outflow of international capital. 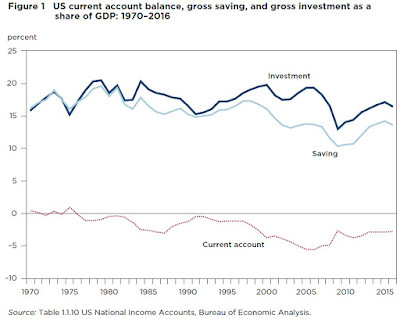 In an economy without any international trade, the domestic savings of the economy has to equal domestic investment--because domestic savings is what provides the finance for domestic investment. But if an economy is open to trade, then a trade deficit means that there is an inflow of capital from abroad: specifically, an inflow of capital equal to the trade deficit itself. Thus, the US economy is a low-saving, high consumption economy. Indeed, the US economy consumes more than it produces, which it can do by importing more than it exports and running trade deficits. 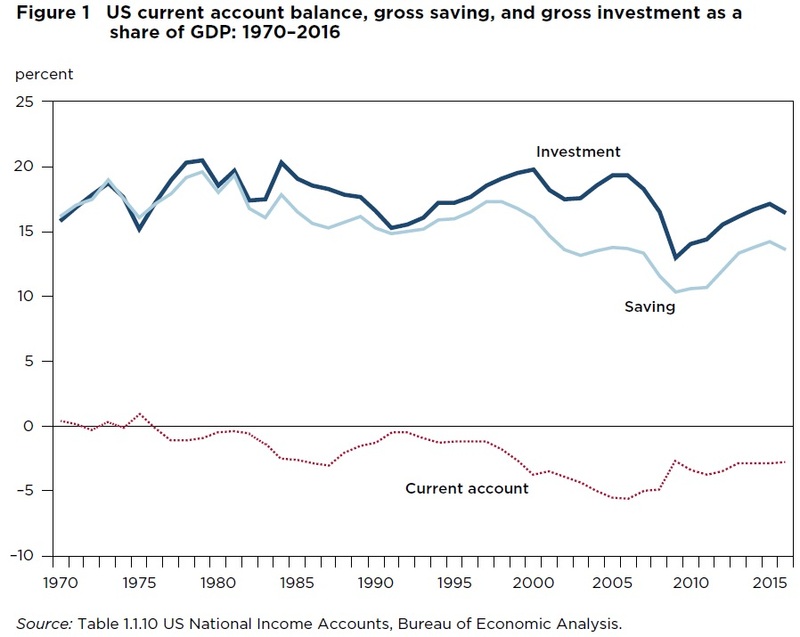 The US economy also has a situation where domestic investment can be larger than domestic savings, because the US trade deficit means that there is a net inflow of foreign capital. Here's a figure from Lawrence's paper to illustrate the point. Notice that the inflow of foreign capital, shown by the trade deficit, is what allows domestic investment to exceed domestic saving. Economist might disagree in their interpretation of the circumstances in which patterns of trade deficits/capital inflows or trade surpluses/capital outflows are beneficial or harmful. But the connection between a trade deficit and an inflow of foreign capital (or between a trade surplus and an outflow of financial capital) is not a "theory" over which economists disagree. It's just a basic understanding of what these terms mean. Trade deficits necessarily mean capital inflows. If the capital inflows from abroad are wisely invested, a trade deficit can be beneficial. For example, South Korea had large trade deficits and inflows of international capital when it was building up its industrial base, and so did the United States in the 19th century. In the 1990s, when the US had large trade deficits and inflows of international capital but was also making very large investments in information technology, there was at least an argument to be made that this pattern wasn't overly harmful to the US economy at that time. The problem arises when sustained trade deficits are accompanied by capital inflows that are not invested in a way that encourages long-run investment and growth. I sometimes try to make this point with a parable about the meaning of trade imbalances between Robinson Crusoe and Friday, as I laid out in "Trade Imbalances: A Parable for Teachers" (July 18, 2012). As noted above, it is silly to try to explain movements in trade balances with abrupt changes in trade policy. Instead, the movements in trade balances are easily explained by macroeconomic factors like consumption and saving. This is clearly untrue, based on US experience with larger trade deficits and vigorous economic growth in the 1980s, 1990s, and early 2000s. reason for these declining shares has been rapid productivity growth coupled with demand that is relatively unresponsive to lower goods prices and higher incomes ... "
In other words, manufacturing workers keep getting more efficient, so it takes fewer of them to make the same level of output. However, as incomes rise, the quantity demanded of manufacturing goods isn't rising as much--and so fewer manufacturing workers are needed, in the US and everywhere. It's just silly to argue that trade should be balanced on a bilateral basis, between any two countries. Even in a world with only three countries, it's easy to imagine a situation in which each country has a surplus with one of the other countries and a deficit with the other. No two of these countries would have balanced trade with each other, but all three would have balanced trade overall. But the bigger point is that there's no reason that countries should be seeking an overall balance of trade, either. Some growing economies will want to welcome inflows of international capital, which means that they will have trade deficits. Some more mature economies, like Germany and Japan, will generate more in domestic saving than they can find a way to productively invest, and so they will run trade surpluses and have net outflows of financial capital. There are subtle and debateable issues about trade policy. But thinking that the size of trade deficits measure the level of unfairness in trade is just wrong-headed. 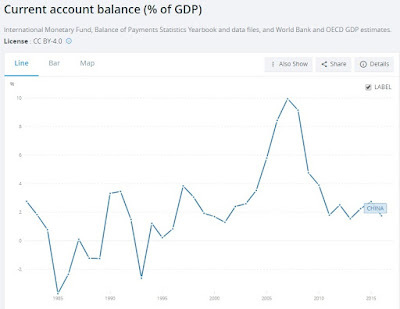 If you think that trade surpluses mean economic strength, tell it to Japan, which has been experiencing a combination of trade surpluses and miserably sluggish economic growth since the early 1990s. Even if the US had no trade deficit, many of its companies and industries would still need to face tough international (and domestic) competition. As economists of all political beliefs will point out, the only way to ensure a lower trade deficit is to have an economy with either higher domestic saving or less domestic investment--and because less investment isn't typically a great idea for long-run growth, higher domestic saving is the preferred policy tool. If you understand that point, you can at least start to grapple with what a trade deficit actually means. What if Country Bonds Were Linked to GDP Growth?